This weekend in the world of cartoons we have a rather epic spread for you. We look back at a Thanksgiving Regular Show episode, a new Lego Star Wars special, and a Goonies voice-over reunion on Teenage Mutant Ninja Turtles! The Marvel cartoons (Hulk and the Agents of S.M.A.S.H. and Avengers Assemble) are off this weekend. As always - minor spoilers ahead! Steven Universe - "Cat Fingers"
Steven uses his shape-shifting abilities to give him what every child wants...digits shaped like little cats. Is this an improvement for Steven? Regular Show - "The Thanksgiving Special"
Regular Show's Thanksgiving special emphasizes the warmth and positivity of the holiday, while giving us a rare glimpse at Mordecai and Rigby's parents. Check out pair's Thanksgiving song in the clip above. Meet James - he is a little odd (Jake believes he *might* be a bumbling saboteur), but this member of the Candy Kingdom means well. Teenage Mutant Ninja Turtles - "Slash and Destroy"
Slash, a mutant turtle you may remember from the first incarnation of TMNT, faces off against three of the turtles this week. Why just three? Slash used to be Raphael's pet turtle. Slash is guest-voiced by Corey Feldman while Raphael is voiced by Sean Astin, making for an impromptu Goonies reunion. My Little Pony: Friendship is Magic - "Castle-Mania"
Celestia requests a mission from Twilight and Spike, asking the pair to investigate the ruins of her old castle. As Twilight and Spike soon learn, the fortress has changed since Celestia last lived within and a new resident is in her place - the Pony of Shadows. 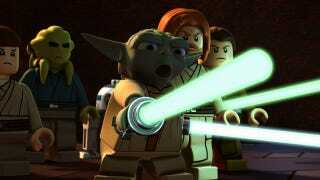 Lego Star Wars: The Yoda Chronicles- "Attack of the Jedi"
Top image courtesy of Disney and Cartoon Network.